Eid is fast approaching and I am sure my mother’s will not be the only household to be filling up with children…although to be 100% honest Eid is just and excuse for this recipe. I have made it on a normal weekend just because….either way they are perfect for both little hands to grab as well as big ones. So anyway what is a cookie and brownie cup? exactly what the name says, it is a cookie bowl filled with brownie. 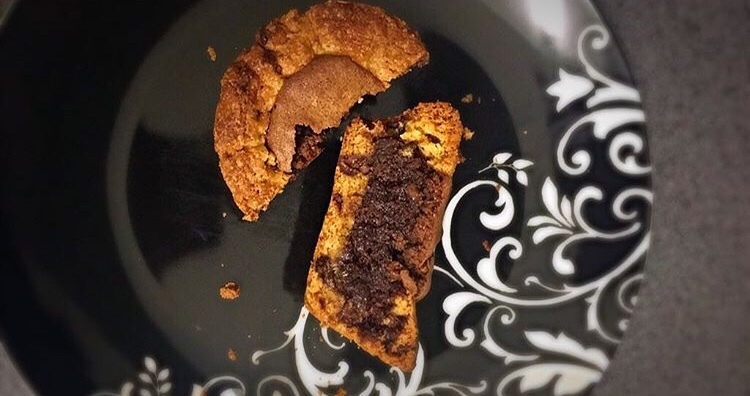 The idea came as I saw this trend of the cookie cup, that you drink milk out of and I know that people have been making it with peanut butter but I like chocolate, so the obvious choice for me was brownie. You will need a muffin tin and my tip for easy extraction is this: cut baking paper into small strips and place them in the middle of each greased compartment leaving the tips poking out of the sides. You will be making 2 sets of batter for this so lets start. Cream the butter and sugar until creamy, add the vanilla and egg and beat well. Add the flour, baking soda and salt and mix with a spoon until incorporated. Add the chocolate chips, and stir. Add 1.5 spoon into a muffin tin compartment and with you fingers push it to the bottom and sides so it makes a cup. Melt the butter and chocolate in a pot on a low flame and stirring, you can also use a bain marie, make sure not to burn. Take it off the stove and add sugar, eggs and vanilla and whisk until all combined. Add the flour and salt and mix until incorporated. Pour the brownie mixture into the cookie cups but do NOT overflow, only fill it up to 2/3. Bake for about 12-13 minutes, you will be able to see that the brownie has set. Let it cool and to take them out of the pan just pull on the edges of the paper. The two best things mixed into one… Yum! !